The IVA Model inflation valve is a high-performance, highly reliable, lanyard actuated valve, designed for rapid and consistent inflation of many types of inflatable devices. The Survival Solutions IVA Model is constructed of rugged naval brass and plated with nickel for anti-corrosion purposes. The valve is designed for marine applications. The Survival Solutions IVA-A Model is constructed of lightweight aluminum and hard anodized for durability. This valve is designed for the aviation industry. The Survival Solutions IVA Model incorporates a modular design. It has available multiple interfacing thread patterns to accept virtually any cylinder on the market today. Further, the IVA Model has numerous outlet connectors available to meet your specific design requirements. The Survival Solutions IVA Model inflation valve is supplied standard with a 360° “free floating” pressure balanced outlet connector. 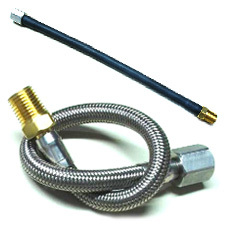 This unique feature allows the use of short hose assemblies and simplifies system plumbing. Other positive features include single body construction and an isolated charging receptor port. This compact valve assembly will give superior performance in the most severe environmental conditions, including underwater actuation. Each valve assembly is marked with consecutive serial numbers for lifetime traceability. Many other types of inflation valves are available including Squib Operated, Puncture Zero Leak valves and several very high flow designs. These ICVs have features, from low profile with 90° with 360° "free floating" pressure balanced inlet which simplifies system plumbing and helps to prevent hose kinking, and performance designed to prevent "ice up" in carbon dioxide systems. Model options are available in standard or high flow design. Other options have direct inlets with either male female fitting for direct connection to inflation valve where limited space is required. Several inlet thread and interface outlet options are available including bondable neoprene. The Survival Solutions Pressure Relief Valve (PRV) is manufactured with durable, lightweight plastic. The Survival Solutions PRV utilizes a unique design that will perform when needed most. The Survival Solutions PRV comes in open and close pressure ranges from .02 PSIG to 10 PSIG and several thread or installation options. Shown are the standard PRV-(X), the high-flow PRV-(X)H, PRV-(X)L, and our PRV-HFF which boasts flows to 70 Cubic Feet per minute. The Survival Solutions Model TVS and TOV are performance designed to operate in severe cold temperatures with their simple and low cost design exceed where other types fail. 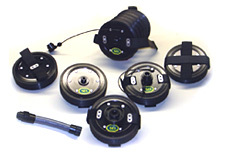 Models are designed for rapid deflation with no tools or required adaptors with just the twist of the top. The Survival Solutions Universal Flange System and Accessory Components Package offers a number of significant advantages for the inflatable device manufacturer. During the manufacturing process, only the flange itself need be attached to the inflatable device. The various accessory components need not be installed until final assembly. Should a particular component require servicing, it can be easily removed and repaired, or replaced without compromising the flange attachment to inflatable device. Exclusive U.S. distributor of “LUXFER” brand cylinders to the inflatable market. Available in Aluminum and with Composite wrapped Aluminum manufactured in compliance with the U.S. Department of Transportation Exemptions . Liner material is alloy 6061-T6. Foreign approvals from Canada, the United Kingdom, and Japan are applicable to specific models. Cylinders include testing by an independent inspection agency approved by Associate Director of Operations and Enforcement, U.S. Department of Transportation. Cylinders include commercially cleaned interior and exterior and the standard D.O.T. markings. Standard Hose with 5/16" I.D. Model HPP Hand Pump/Bailer has been performance designed to operate in severe cold temperatures and with effortless operation when pumping both air and water. Model HPP-L has been designed to meet both requirements of hi-flow and compactness. It will fit in the most smallest of spaces with .8 liters per stroke and has the option of adding a spring which will allow one handed operation in the event of injury. Outlets are available for most applications. without filling a large cylinder. Manifolds distribute airflow in large inflation systems. The Manifolds are available in both nickel plated brass and anodized aluminum with many outlet and mounting configurations. We can custom make a manifold to meet your design specifications. Many other repair kits are available.